The Cyclone is a dizzying mishmash of curves, spirals, and drops which will put your marbles through a whirlwind marble race! The Cyclone is Quadrilla's largest marble run set, with two spiral funnels, twelve curved rails, ten accelerators, and a large assortment of building blocks. Quadrilla's The Cyclone can be combined seamlessly with Quadrilla's other marble run sets. 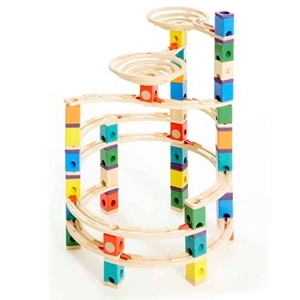 All Quadrilla marble run sets are crafted with high quality birch and rubber wood for long-lasting marble racing fun! For ages four years and up. • The Cyclone by Quadrilla is the largest marble run set, with 198 pieces to encourage all sorts of speedy marble fun. • Quadrilla's The Cyclone has 198 total pieces, including: two spiral funnels, twelve curved rails, and ten accelerators. • Made from Baltic Birch plywood and rubber wood. Graphics are screen-printed directly on the wood. Finished with child-safe paint. • Made by Quadrilla, a leader in designing and manufacturing high quality baby and children’s toys made from sustainable materials. Note: If you chose expedited shipping for this item, there may be shipping charges additional to what is quoted by the website. Please contact us before selecting UPS 2nd Day Air or UPS Next Day Air to determine if there will be any additional charges.